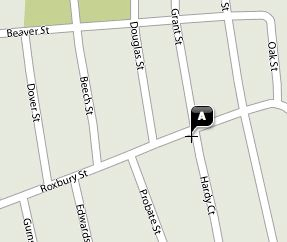 Live Maps gets the location right, but it shows a Roxbury/Hardy Ct. intersection that does not exist. 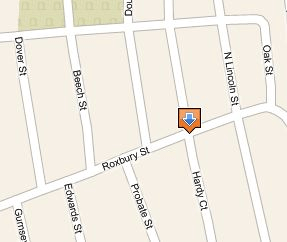 Long ago, we believe that Hardy Ct. did join Roxbury St, but at some point that changed and now it’s a dead end as shown correctly in Google Maps. What to do? 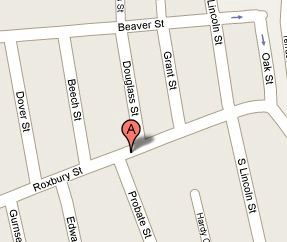 I tried adjusting the lat/lon parameters in the Google Maps URL in order to move the pushpin to the correct location. That turned out to be more trouble than it was worth, so I just took a picture of a map, stuck a marker in the right place, and published that. Along the way, I noticed a few things about these online maps that I’ve never considered before. First, in all these applications, it’s harder to work directly with lat/lon coordinates than I would have thought. Everything’s geared toward street addresses, which makes sense most of the time for most people. But as GPS coordinates become commonly available, shouldn’t they be first-class citizens in these user interfaces? Despite the digitization of maps and the satellites circling the earth, the cartographic revolution still relies heavily on fresh observations made by people. He goes on to describe a tour of the area near LaGuardia Airport with a pair of Navteq “field researchers” who spend their days comparing maps with reality. There are six hundred people doing this work. But wait a sec. We’re living in the Age of Web 2.0 Participation. It’s a Two-Way Web. I know where my house is, and everyone on the east side of town knows that Hardy Ct. is a dead end. Shouldn’t there be an obvious way for millions of people to convey the ground truths they know to Navteq and Tele Atlas? I live in a very small town in a rural area in Canada. Both Google and Yahoo! actually have incorrect spelling (badly so) for nearly all of the street names in my town. I’ve never noticed a way to tell anyone how to correct it. This is going to be the issue that possibly breaks my serious brand loyalty towards Garmin. Less than 1 month after I bought my nuvi, the 35W bridge collapsed (I live in a Mpls suburb). Obviously this was not the main tragedy that day, but it did render that device effectively useless for directions around town, as you are always going over that bridge, and they didn’t offer updates. I understand that TomToms do have some type of community updates, and owners of those devices could update with in a couple hours. I think crowdsourced geo data makes sense. It will likely became the next spam and virus vector before long, but we still need to get with it. Well how about that? Very cool, thanks! You have to be logged into a Google account, so that’s one level of accountability. Then there’s a reviewable change history so if people are monkeying around you could see what was happening. Very nicely done. Hat tip to Google! Shouldn’t there be an obvious way for millions of people to convey the ground truths they know to Navteq and Tele Atlas? Have a look at http://www.tracks4africa.co.za. This is not exactly what you are talking about, but their maps are pretty extensive and covers the sort of places that the other map providers don’t cover. Very usefull when traveling off the beaten track in africa. I forgot to mention, there is also a google earth layer for tracks4africa so it is pretty easy to get an idea of their maps. Interesting. These are ways to correct Google Maps (though nobody would discover 2) — is there a way to correct Live/Yahoo? Of course that’d be a trickier correction, you’d have to be able to remove half of a street segment. Very interesting. There, I was able to remove that half segment. A less savvy user wouldn’t have gotten that far, but after some fiddling I did sort out how to do it. Again, very cool! Of course, this all serves to remind us that the multiplicity of data sources and providers will fragment users’ efforts to contribute corrections. > Of course, this all serves to remind us that the multiplicity of data sources and providers will fragment users’ efforts to contribute corrections. google, I believe, has an agreement with teleatlas to send them back the fixes they get. at least with the map data, I presume they keep the local business corrections to themself. incidentally, google switched within the last few days to using teleatlas exclusively, no more navteq data. With all the GPS systems driving around in automobiles, I’d like to see the map data aligned with the GPS location. I’m always amused when my GPS system thinks I’m 100 feet off the side of the road. But, I’m all in favor of community feedback too. Just for anecdotal evidence. I was looking around Toronto, Ontario in Satellite mode and noticed some image tearing near a mall. The images were not lining up correctly for several blocks. I emailed Google via the contact (http://maps.google.com/support/bin/answer.py?answer=98014) and within two days the problem was resolved. How many people are required to verify a change? Who verifies that they are credible? Would it be possible to formulate a GDOS (Geographic Denial of Service) “attack” which removed someone’s street from mapping services, thereby rendering it impossible for them to receive deliveries (at least from carriers that use electronic mapping to speed their delivery persons)? “the acquisition could strengthen TomTom’s newly introduced MapShare service, which allows users to update map data manually to increase map data accuracy and reliability. BTW: in some EU countries, there are already traffic (jam) information services based on the (anonymised) location information of moving (or not) mobile phones collected by the telco. > need for dedicated map data providers. Or maybe it will just transform their business into something different. With millions of contributors, I can still imagine a need for a team of hundreds of paid managers/coordinators/gardeners. I love the mission statement! Two summers ago I was vacationing back east and I stopped Keene on my way from Maine to New Jersey to spend a couple of hours trying to recreate your Google Maps walking tour of Keene, NH (http://weblog.infoworld.com/udell/2005/02/25.html#a1185). My goal was to try to shoot QTVR panoramas of spots along the way in order to enhance the original tour. (I’ve still got some of these somewhere, if you’re interested, though I’ve never formally put them together in the way I had originally intended.) Anyhow, I got curious where you lived and looked you address up in the local phone book. Too shy to walk up and knock on the door, I did snap a few photos of your house and eventually I posted and geotagged them in Flickr. You can find them here: http://www.flickr.com/search/?q=Jon%20Udell%27s%20house&w=all Keep in mind that the geotagging on the photos marks the location from which I shot the photos, rather than the location of the subject of the photos. Anyhow, it seemed unlikely that anyone would have gone looking for your house in Flickr, but if they had, they would have found my geotagged photos. One person did look, and did find them: me. You should’ve knocked — or anyway, called! It is weird, though, isn’t it, being locatable in the ways we are now. I suppose in the future — i.e. now — we’ll want to have sensors that watch out not only for mentions of our names online, but also mentions of our locations. I was able to correct our house location on Google, I did that in December. But that doesn’t fix Yahoo, Mapquest or any other map provider. The fix doesn’t appear to make it back to data providers. I did call Navteq a few years ago and pointed out this error, they were the Google data provider at that time. But they didn’t have a way to accept the update. “Welcome to Cyclopath, the geowiki for Twin Cities bicyclists. You can use Cyclopath to find routes and share information with other cyclists. Shouldn’t be too hard right? For example, TomTom (car navigation) comes now with models that will broadcast back information (which lets TomTom detect where traffic jams are located). Similarly, if you never saw anyone driving across that closed of part of the street you could draw the conclusion that it’s become either a) unusable or b) non-existent, right?